(JTA) – A Jewish professor visiting Germany described being assaulted in a Bonn park – first by a Palestinian who said “I f*** Jews,” then by police who slammed him to the ground and punched him in the face. Yitzhak Melamed, who teaches philosophy at Johns Hopkins University in Baltimore, in a lengthy Facebook post published Friday, July 13 accused the police of brutality, then of whitewashing their conduct and falsely blaming him for provoking the assault. Police subsequently apprehended the assailant. 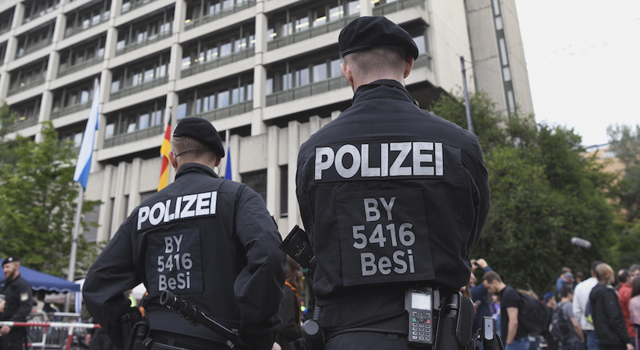 The incident on Wednesday, July 11 is the latest in a string of antisemitic assaults in Germany. He then threw Melamed’s kippah to the ground three times and pushed him three times. In response, Melamed said he tried to kick the man in the groin twice but missed both times. The attacker fled after hearing a police siren. Melamed wrote that two police officers ran past the attacker and tackled him instead, then two or three other policemen helped pin him to the ground and handcuffed him. He said police punched him in the face several dozen times, bloodying him and breaking his glasses. A police officer then suggested that Melamed provoked the beating, Melamed wrote. He responded by describing his ancestors’ deaths in the Holocaust. After being taken to the police station, Melamed wrote that police did not tend to his wounds and repeatedly tried to dissuade him from filing a complaint against them – including by suggesting that he attacked the police first, and by threatening to accuse him of resisting arrest. Eventually he was taken to another office, where he filed a complaint. The next morning, Melamed wrote, Bonn’s police chief came to his hotel to apologize. But Melamed said the police department’s statement on the incident, published later that day, falsely blamed him for resisting them. According to a police statement on PressePortal, a German press release platform, police said Melamed “failed to comply with several requests from the officials to stop” and “fought against the measures” of the police. “Try (if you can) resisting arrest either when you are not in any bodily contact with the police, or, alternatively, when 5 policemen are on your back and you are barely able to breath[e],” he wrote. Herbert Reul, a local German government minister, also apologized to Melamed, and said, “We will not allow Jews to be persecuted once again in Germany,” according to Deutsche Welle.